viscount aero wrote: To my knowledge, nobody is necessarily anti-math in the EU community. Here's another picture made up of six stacked and realigned images. Personally, I think the flickering white spot which "reflects more sunlight than its surroundings", is some stranded aliens with a mirror signalling SOS, as we were taught in boy scouts. They stopped to chip off some ice when their water supplies were running low and couldn't take off again due to a fault with the ole' flying saucer. Look at the crater centre bottom of the left hand image. Its still a little hard to see clearly, but that does look fairly hexagon shaped to me. I'm doing a little literature review on what's known about Ceres up until the Dawn arrival. 4) absence of a related asteroid family (there should have been plenty of Ceres-family asteroids, like there are lots of Vesta- or Pallas-family ones, yet there seemingly are none) - some people state that this is because the "snow line" is at 3 AU (which is farther out from the Sun than Ceres' orbit), so the pieces of ice that might have been removed from Ceres simply evaporated in a dirty-snowball fashion, thus no family was formed. 4) I'm not sure; probably goes in pair with 3) - since not a big amount of material was removed during a history of the body's formation, so there are not many related objects. The catastrophic epoch kind of spared our main-belt beauty. Also orbital stability considerations should be taken into account: maybe Ceres simply was too large for its offspring to actually leave etc. What's your thoughts on this, anyone? paladin17 wrote: What's your thoughts on this, anyone? I agree with most of what you said. Mainstream sites frequently used "flickering" to describe the white spots so I'm hoping there's evidence of an actual discharge. In the most recent images, the upper spot of the right view looks a bit more three dimensional than the others, which appear to be the craters themselves. What observations of Ceres do you think would differentiate the EU view from the standard model? 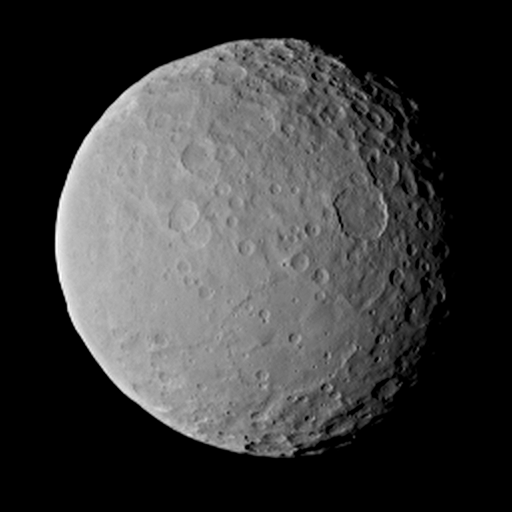 Here is one of the latest pics of Ceres; apparently one bright spot has now been revealed to be two. I wonder if they might be elecrical discharge arcs. The twin "arcs" in the crater sure look like electrical arcs by now. Who woulda thought that observations of Ceres might end up being the holy grail for electrical machining theory? Rossim wrote: Who woulda thought that observations of Ceres might end up being the holy grail for electrical machining theory? Perhaps yes. I'd like to see the near orbit, hi-def images once Dawn goes into orbit. This may prove very interesting beyond expectations. The little planets seem extremely interesting worlds. Very complex. Xuxalina Rihhia wrote: Here is one of the latest pics of Ceres; apparently one bright spot has now been revealed to be two. I wonder if they might be elecrical discharge arcs. The twin "arcs" in the crater sure look like electrical arcs by now. A Hexagonal crater (I think a different one to the last one I pointed out) just below and to the right of the crater with the bright spots. Its very clearly visible in that shot. Apparently, due to cracks in the surface that pre-date the impact. Since a weakness exists along those fault lines, the crater rim tends to end up there instead of being round like we would expect from an impact. Amazingly, the fault lines just ended up dividing the surface into convenient hexagonal zones all ready to be impacted into hexagonal craters. Who would have thought it? I also notice a much bigger hexagonal or possibly pentagonal crater in some of the images, it appears to be older as is has other craters "on top" of it. Pentagon shaped crater bottom middle of the image. The electrical interactions make the crater, it widens over time, always discharging/eroding at the rim. So we do not need any interacting bolide to create crater features at all (my conclusion). It was a frangible, hollow point meteor that made the hexagon pattern.